I used an excel spreadsheet It would be way too complicated to add it all up in my head! Oh dang, did I miscount? I had my final score at 61.5 points... not that I had a fancy Excel spreadsheet though, LOL! Just for fun, this is what I got when I added up all of the final challenges... poorly ... by hand. It's not ordered by points, but by order of the first challenge! It's probably really incorrect LOL! Now there must be a fight for the prize, THERE CAN BE ONLY ONE! Grand Finale has been scored! And the Hunt winners are announced here! Woot! LOL no worries, at least I'm not as far behind as I thought! Congrats to the winners!! I just have my ponies do the math around here. Punk, I brought you in this world, I can take you out. BAM! We don't need no math around here! 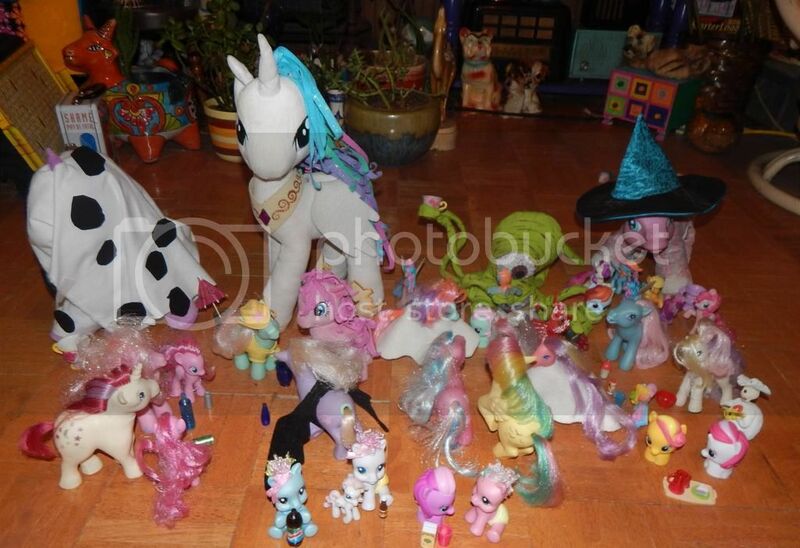 If you thought taking all the pics was hard, getting the Ponies back under control after the cast party was worse! Man. Our Ponies got wasted! Not the babies though. We have a little parental control. Reactions: cutekitten, Harmony and h1m3. Some of those are my ponies. I said 'our' Ponies. I ain't tryin' to bogart Poines. I see you over there looking at my ponies thinking of ways to steal them from me!